Save up to an additional 25% off already discounted prices. "I would like to thank The Back Pack crew for all their help and great wisdom through this process. I'm so glad I found The Back Pack! Every time that I call, I am greeted with extreme courtesy and professionalism. What a pleasure it is to deal with The Backpack! I will be back next year." thank you. You have been so kind! I am so excited and really looking forward to next year....thanks to you and all your help!! You have been great through the whole process. The Back Pack offers an incredible selecton of used textbooks, used Teacher editions and supplemental materials for grades K-12. Whether you call us to buy used textbooks or used Teacher editions, for help with curriculum development, or to ask questions about our products, you will talk to a real live person! We will assist you with old fashioned personal service which insures that you get exactly what you want.... the first time. You can reach us Monday through Friday from 9 to 5 EST. We look forward to serving you! If you do not need assistance and prefer to place your order online, go to our other website www.used-textbooks-online.com. 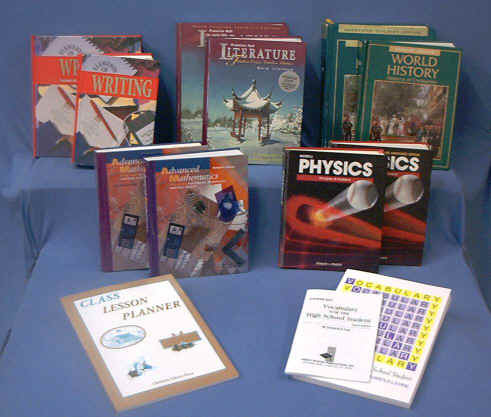 Used textbooks, Used Teacher Editions and Used Teacher Resources are being added frequently to this site. Same company - two websites. We specialize in out of print textbooks. If you need multiple copies of a title, call us. If we don't have the quantity you need, we'll do our best to find them for you. We will also locate out of print textbooks for you if you can't find them on our website. The Back Pack was founded in 1990 and was one of the first companies to provide curriculum to Homeschoolers. In fact, that is the reason we started our company, to provide Homeschool Curriculum to Homeschoolers at discount prices. Now, not only do we serve Homeschoolers, we also serve Teachers and Schools. We also provide customized Homeschool Curriculum Packages at discount prices. Geography, Reading, Literature, Foreign Language, Science, Biology, Physics, Chemistry, Latin, Home Economics, Mathematics, Algebra, Geometry, Geography, Automotive, Career Development and much more. We will assist you with all of your used textbook needs. "I have used a lot of book dealers and the best book dealer that I have found is without a doubt, The Backpack. I highly recommend them!" "Doing business with David and Joan at The Back Pack has been an absolute pleasure. We opened a new charter school in the summer of 2014, and they worked within our budget to help us select high-quality books at a great price. We opened smoothly and have all the textbooks, leveled readers and classroom resources we need, and are forever grateful to David and Joan for sharing their expertise with us. For great books at a great price, The Back Pack can't be beat!"